Mobile data service for smartphones and tablets, in addition to wired lines, is being placed under the new rules. The order also includes provisions to protect consumer privacy and to ensure that Internet service is available for people with disabilities and in remote areas. Three-quarters of households have the choice of only one broadband provider while only a quarter have at least two to choose from. *Defined by the Federal Communications Commission of at least 25 megabits per second download speed. Before the vote, each of the five commissioners spoke and the Republicans delivered a scathing critique of the order as overly broad, vague and unnecessary. Ajit Pai, a Republican commissioner, said the rules were government meddling in a vibrant, competitive market and were likely to deter investment, undermine innovation and ultimately harm consumers. The impact of the new rules will largely hinge partly on details that are not yet known. The rules will not be published for at least a couple of days, and will not take effect for probably at least a couple of months. Lawsuits to challenge the commission’s order are widely expected. The F.C.C. is taking this big regulatory step by reclassifying high-speed Internet service as a telecommunications service, instead of an information service, under Title II of the Telecommunications Act. The Title II classification comes from the phone company era, treating service as a public utility. But the new rules are an à la carte version of Title II, adopting some provisions and shunning others. The F.C.C. will not get involved in pricing decisions or the engineering decisions companies make in managing their networks. Mr. Wheeler, who gave a forceful defense of the rules just ahead of the vote, said the tailored approach was anything but old-style utility regulation. “These are a 21st-century set of rules for a 21st-century industry,” he said. Opponents of the new rules, led by cable television and telecommunications companies, say adopting the Title II approach opens the door to bureaucratic interference with business decisions that, if let stand, would reduce incentives to invest and thus raise prices and hurt consumers. The F.C.C.’s yearlong path to issuing net rules to ensure an open Internet precipitated an extraordinary level of political involvement, from grass-roots populism to the White House, for a regulatory ruling. The F.C.C. received four million comments, about a quarter of them generated through a campaign organized by Fight for the Future, a nonprofit advocacy group. An overwhelming majority of the comments supported common-carrier style rules, like those in the order the commission approved on Thursday. In the public meeting, Mr. Wheeler began his remarks by noting the flood of public comments. “We listened and we learned,” he said. In November, President Obama took the unusual step of urging the F.C.C., an independent agency, to adopt the “strongest possible rules” on net neutrality. In January, Senator John Thune, the South Dakota Republican, began circulating legislation that embraced the principles of net neutrality, banning paid-for priority lanes and blocking or throttling any web content. But it would also prohibit the F.C.C. from issuing regulations to achieve those goals. This week, the Republicans pulled back, with too little support to move quickly. Also at the Thursday meeting, the F.C.C. approved an order to pre-empt state laws that limit the build-out of municipal broadband Internet services. The order focuses on laws in two states, North Carolina and Tennessee, but it would create a policy framework for other states. 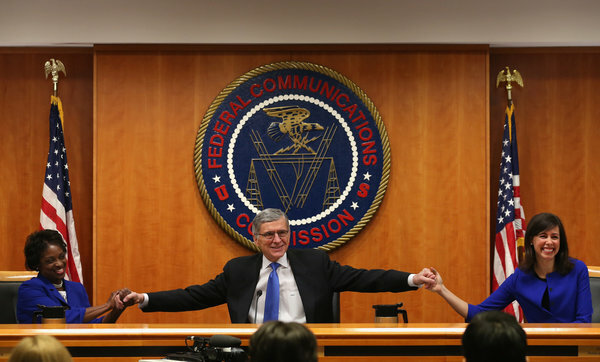 About 21 states, by the F.C.C.’s count, have laws that restrict the activities of community broadband services. The state laws unfairly restrict municipal competition with cable and telecommunications broadband providers, the F.C.C. said. This order, too, will surely be challenged in court. An earlier version of this article misstated the role of the F.C.C. under the new rules in pricing and engineering decisions companies make for their networks. The F.C.C. will not get involved in those decisions; it is not the case that they will get involved. Rebecca R. Ruiz reported from Washington, and Steve Lohr from New York.